Ok, I’m sorry, but this guy totally cracks me up. With just a few days until I have baby #3 (yes, it is currently nameless… we are working on that! )… I could definitely use a good laugh and this video did the trick! Not only is the guy just funny but, I love what he says at the end of the video. 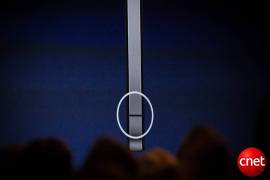 I also think it’s hillarious that Apple opened their press conference today with this video. I’m sure many of you have already seen it but if you haven’t… totally worth checking out (video below). Apple has released the firmware promised to fix the signal bar issues with the new iPhone 4. To make this clear, the problem, for me, seems to be a hardware issue. When I hold the iPhone in any way that covers the gap between the two antennas, I lose signal strength. I’ve demoed this in the video below. Now, does the firmware fix the problem? Let’s find out! I’ve also recorded what happens when holding the iPhone in the same way on the new firmware, 4.0.1.